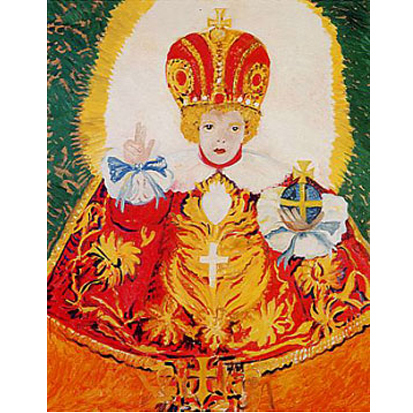 Slonem lived in Mexico and Nicaragua during college and since the mid 1970s, he painted Saints and mythical symbols of Central America. Mexican art and mystic symbolism have been the most significant resources for his art to date. Best known for his paintings of tropical birds, Slonem has produced paintings of animal and mystic images, using intense colours and highly patterned composition. His oil colours are often so intense that they look like acrylic paint, as in Suite Butterflies series (1999). Since 2000, Slonem’s paintings have been more expressive and mystic, not through bright colours, intensive hues and subject matter itself, but through creating the texture on the surface of canvases. His portrait paintings in 2002, such as Nazimova and Alfred Hitchcock showed the rugged surface of canvas, revealing the layers of scratched patterns of paint. In the recent paintings like Guardians (2006) and Cockatoo Whisper (2007), Slonem used the subdued colours and the scratched surface to create the mystic atmosphere. Slonem had numerous international shows including in Venice, Paris, Amsterdam, Madrid, Stockholm, Oslo, Cologne, Tokyo, and Hong Kong. In addition to the panoramic mural for the Briant Park Grill at the New York Public library (1995), his paintings have been collected by the Metropolitan Museum of Art, NY as well as AT&T, IBM Corporation and Marriot Corporation. 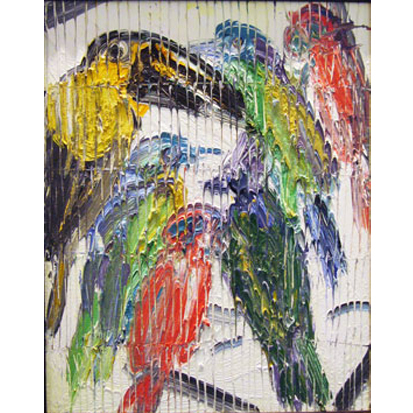 Artist and collector Hunt Slonem is best known for huge Neo-Expressionist oil paintings of tropical birds based on his personal aviary. 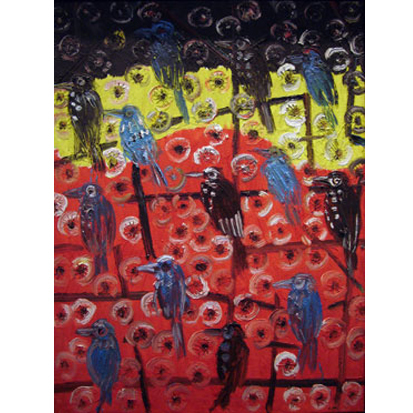 His lavishly colored canvases are populated with rows of birds rendered with thick brushstrokes. “I was influenced by Warhol's repetition of soup cans and Marilyn,” Slonem says. “But I'm more interested in doing it in the sense of prayer, with repetition... It's really a form of worship.” According to The New York Times art critic Roberta Smith, “This witty Formalist strategy meshes the creatures into the picture plane and sometimes nearly obliterates them as images, but it also suspends and shrouds them in a dim, atmospheric light that is quite beautiful.” Besides the birds, Slonem also paints repetitions of flowers, bunnies, butterflies, as well as portraits, particularly of Abraham Lincoln.